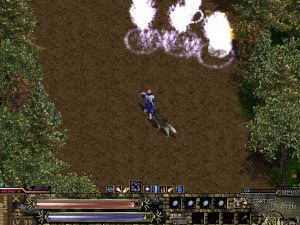 ShadowFlare is a mission-based PC action/role-playing game that consists of 4 episodes. You start your journey as a hired mercenary working for gold, precious items, and fighting experience in a demon-ruled land. As you adventure through the vast ruins of what's left of the world, you'll deduce what happened and who's responsible for the devastation. Once you've reached a certain skill level in the game, you'll be able to choose a new profession for your character as a warrior, wizard/witch, or hunter. ShadowFlare has a high level of difficulty; however, you will have an animal companion to fight alongside you so don't worry. You will come across many acquaintances, foes, and friends along the way, including the original demon himself, Dignosis, and his rival, the white angel Altecia.